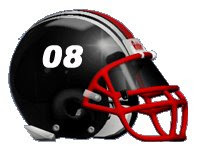 Although Orrville holds a commanding edge in the all time series, it has been a very even matchup since the series resumed in 2005, with Orrville winning 2 of the 3 meetings. All three meetings have were not decided until the 4th quarter, with the 2005 game going into overtime. Northwest is coming off a 12 win season that saw them advance to the regional finals, while Orrville is coming off a 6-4 season. What Orrville must do to win: The Riders must pull off a diffucult feat of beating a solid opponent while at the same time, answering some questions on the offensive side of the ball. Simply put, talent is going to have to surface for the Riders to pull off the victory, no matter how pretty or ugly it looks. Big plays and turnovers will be key for both teams, but especially for the Riders, who will be breaking in many new skill players as well as a brand new defensive scheme. Many Red Riders will play both ways so conditioning will be important too. What Northwest must to do win: Protect the ball, control the line of scrimmage, and not let Orrville's big play ability change the course of the game. The Indians strength will be their run attack, but don't be surprised to see them test Orrville's DB's early. Key players: Orrville's Chase Hoobler and Northwest's Danny Beers. Hoobler anchors the Riders revamped defense and figures to be part of every play from his middle linebacker spot. Beers will be the focal point of the Northwest running attack, and will have a big line opening holes in front of him. Summary: This matchup has become a week 1 classic and offers a boat load of computer points to the winner. This is a great matchup for fans of high school football, but it would be nice to see this game played later in the season once each team has had a chance to get their feet under them. Prediction: Both teams struggle early but the Riders eek out a win on a late field goal, 24-21. Hope is ever present in late July and early August if you're a fan of high school football. Will this be the year? Who will take so-and-so's place? Will we win the conference? Will we beat Wooster (again)? How tough will our region be? Most importantly....How do "our boys" look? 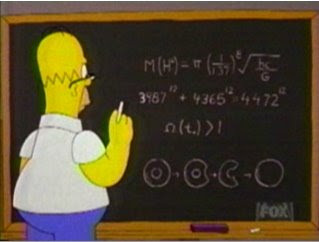 In the following post, I'll try to give my best "gut feeling" as to how 2008 will play out. Start Strong. It's every team's goal to start strong out of the gate, but it has and will continue to be a terribly important goal of the 2008 Red Riders to get off to a good start. Easier said than done unfortunately. Game 1 has the Riders travelling to Canal Fulton to take on the Northwest Indians, fresh off an undefeated regular season, regional runner up and school record tying 12 wins. This game provides an assumed mother lode of computer points to the winner, while the loser plays the "what if" game. Exhibit A - 2007. If the Red Riders could have capitalized on numerous chances and beaten Northwest, and if Northwest had gone on to finish 9-1, Orrville would have made the playoffs as an 8 seed. You hate to put the "Must Win" label on a week 1 game, but with this game boosting the winner so much in terms of playoff points, it's is as close as you can get to a week 1 "must win." #52. Simply put, the return of senior Josh Short from a bout with leukemia should give this team all the motivation in the world to put their best effort forth and never give up. Josh has been an inspiration to the entire school and town, and it will be great to see him on the field, and even more special will be seeing him lead the Riders on the field against Triway at Red Rider Stadium. Week 5 @ Lexington. A team that has always played us well, and throttled us last season. This may be our toughest road test of the season and if there is any serious talk about an OCC title, this game must be won. The Minutemen return a lot of talent and look to improve on their 8 wins last season. Week 7 @ Ashland. Another road test brings the Riders to Community Stadium in Ashland. Ashland shutout the Riders last year 42-0, the first team to shutout the Riders since Mansfield Sr. did it in 2001 (33-0). The Arrows graduated a lot of talent, including Mr. Everything Taylor Housewright, but still plan to bring home their 3rd straight OCC crown and extend their current 15-game OCC winning streak. Week 8 vs. West Holmes. The loss to the Knights last season effectively ended any playoff talk among Rider faithful. Prior to last season, the Riders had beaten the Knights their previous 8 meetings, with the last West Holmes win coming back in 1992. The name of this game should be simple....REVENGE. The Knights return plenty of talent and should have other ideas. This should be a classic "throwback" game at Red Rider Stadium. Week 10 @ Wooster. Nothing more should need to be said. The Riders will hopefully cement a playoff berth with a 4th straight win over the Generals. Wooster hasn't scored on a Rider defense in the last two meetings but will be looking to extend their lead in the all-time series (currently 50-38-9). Who will step up? It's been several years since there were this many question marks on the offensive side of the ball, replacing nearly all talent positions including QB Brynt Werntz, RB Cortez McCreary, WR James Weeman and TE Rhyne Ladrach.....the Riders certainly have some holes to fill. Signal caller will be Joey Besancon, who saw his share of time under center in 2007. Wideouts will likely be staffed by Josh Graber, Sam Miller and Dillon Corbett for starters....but all three of those will be called upon to play defense as well, so another 2 or 3 dependable wideouts will need to step up, Aaric Milligan, LaRicco Woods and Jordan Thomas are 3 I'd like to see become a target. Running back could be a committee format for the 2008 season, other than Josh Graber and Dee Miller, there isn't a whole lot of experience in the backfield. You may see players like one (or both) of the Kazim brothers, Teven Mitchell, or even Trey Simpson take some carries this season. Regardless who is carrying the ball, our run game must be at least respectable if we're to keep opposing defenses on their heels. The offensive line has plenty of returning starters led by Big Kam Barnes, the Monheim brothers and the inspiring return of center Josh Short. This may be the strong point of our offense, or at least the most cohesive unit. I think the strength of the team will be the defense, plenty of experience and returning starters....as well as a new scheme, the 3-5-3. This scheme should expose our quickness and allow us to slow down spread offenses and more evenly distribute our speed and talent over the whole field. Chase Hoobler will be a ball hawk at linebacker and our DB's will be experienced and quick, and I think we'll have enough beef on the D-line to give opposing teams some fits. Like I mentioned above, the D is going to have to be stout early in the season while our offense gets it's traction. Loaded Region. As has been the case for the past several years, Region 13 will again be one of the most difficult in the state. Perennial playoff teams like Mooney, Steubenville, CCC and Akron St. V. will again clog the top 4 spots in the region, leaving only 3-4 spots for quality programs like Orrville, Manchester, Lake Co. Perry and others. The loaded region will make the marquee games mentioned above even more important. In my eyes, the Riders will need to win at least 1 of the 3 biggest games of the season (Northwest, Lexington & Ashland) to make their 20th trip to the playoffs. In 2007, they lost all 3 and did not make the playoffs, the year before we won 2 of those 3 games and finished 2nd in the region. I know it's a 10 game season and every game is important, but in terms of making the playoffs, you can boil the season down to 3-4 games. I think it's going to take at least 20 computer points to make the playoffs, and in the end, I DO think the Riders will do enough to make a week 11 appearance, but we cannot let opportunities slip away and must play well from the start. Defend the Home Turf. The Riders only won 2 of the 5 home games last season, their first losing record at home since 2002. This season's home schedule includes Triway, Mans. Sr., Clear Fork, West Holmes and Mans. Madison. I can't see us losing more than 1 of those games. We've historically done well against Triway, Clear Fork and it's likely that the 2 Mansfield teams will be rebuilding, the only "toss-up" game is West Holmes. With likely only 1 of these 5 games providing big playoff points, it's imperative to win these games and take the 1st level points. Final Predictions. I think this will be a solid year, much more similar to 2006 than 2007. I think we're going to be solid overall, but I don't see any "superstars" on this team will transform us from good to great. As far as record, I'm stuck between 7-3 and 8-2, I think it all depends on the first game, if we win, we go 8-2, if we lose, 7-3. I think we'll end up 5-2 in the league and finish either tied for 2nd or 3rd. I do see us making our 20th playoff appearance and I think we'll have to travel for our first round game. 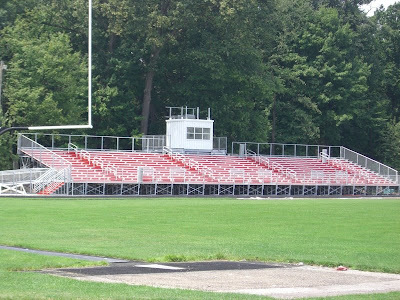 I'd love to see us take on Steubenville, simply to see the turnout between 2 traditionally strong public schools. Now let's go out and play some Rider ball!!! Go Red Go!! Here is a list of Red Rider alumni playing at the collegiate level. I'll provide updates periodically throughout the season. 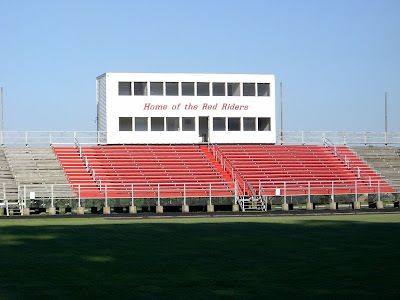 The following is the latest in a series of historical reflections dealing with the Red Riders of Orrville High School and their quest for a football championship in the Ohio High School Athletic Association’s state playoffs. The full archive can be found here. This edition looks at the year 1985.